Goodreads Summary: The Near Witch is only an old story told to frighten children. Remember the days of fairy tales and childhood bedtime stories? 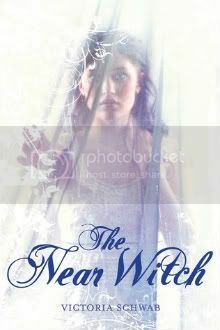 In The Near Witch, Victoria Schwab takes this idea and spins a book from it, creating a haunting tale that seems to transcend time and place. Passed down through the generations, The Near Witch is a legend of something that happened long ago in Near, a story of how good triumphed over evil and the town was made safe. Or so everyone thinks. The witch has long since been dealt with, and now there are no strangers (or witches) in Near. Then one night, Lexi sees a mysterious boy from her window - a boy that she's never seen before. When children start disappearing, Lexi knows she has to find this boy. Using the tracking skills taught to her by her father, Lexi locates him. But once she does, she knows that he is innocent. Yet more children are disappearing, and the town is all too eager to blame the stranger. Lexi realizes she has to uncover the truth about the stranger, as well as find the children, before it is too late. She will have to rely on what her father taught her as well as two village women who might, just maybe, be witches. But can she save everyone in time? The thing I loved the most about this book was the quality of writing. It was unlike anything I had read before, so lyrical and effective at creating an atmosphere that I could not help but be transported to another world. The setting was beautifully crafted; if you have seen or heard Brigadoon, I imagine that the moor in this story has many similarities: an almost magical quality, an air of mystery, and a hidden danger. Woven into this setting and legend were the characters themselves. Lexi was not afraid to challenge authority, make her own decisions, and do what needed to be done to protect her sister. Then there is Cole, the quiet stranger whose past and whose love for Lexi made him completely endearing. I also enjoyed seeing Lexi's interactions with her mother and how things changed over time. However, the one issue I did have with this book was the romance between Lexi and Cole. Although it was by turns sweet and intense, I missed something in the development. I wanted a little bit more buildup, or maybe more information about Cole, before things started happening. That being said, the romance is a nice balance with the increasingly darker, spooky vibe that comes toward the end of the book. A story in which the mood evoked is just as important as the characters and the plot, The Near Witch blended poetry, songs, spells, and proverbs into one unique whole. It is a fantastic debut novel, and I cannot wait to see what Schwab writes next! Lovely review, I've been hearing many positive things about this book! (Although, I have also read a number of negative ones so I don't really know what to think, haha).